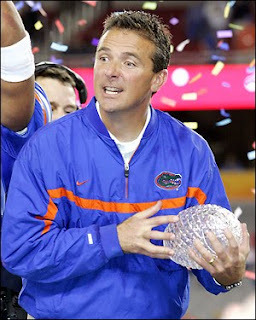 In news that rocked the college football landscape, Urban Meyer will coach his last game at Florida January 1 against the Bearcats in the Sugar Bowl. The reasons for Meyer leaving are said to be health related. It's not known at this time if it had anything to do with his hospitalization after the SEC championship game. Meyer had a piece in SI where he said he had a cyst on his brain, but it wasn't life threatening. I have seen this mentioned a few times on a few sites, but no one really knows what's happening. To repeat, Meyer will coach against Cincinnati in the Sugar Bowl. This adds a huge layer to the game Friday. The Sugar Bowl is racked with coaching turmoil, from Cincinnati having Brian Kelly leave, to Butch Jones being coach and not coaching, to Jeff Quinn accepting the Buffalo job, and now Urban Meyer is stepping down from Florida. Here is what Meyer had to say about everything in a released statement by Florida. “After consulting with my family, Dr. Machen, Jeremy Foley and my doctors, I believe it is in my best interest to step aside and focus on my health and family. “I’m proud to be a part of the Gainesville community and the Gator Nation and I plan to remain in Gainesville and involved with the University of Florida.